The dedicated professionals at Prescription Turf Care take great pride in providing quality lawn care and superior grounds maintenance. Our 30+ years of experience guarantee our services are second to none. We not only work to meet your expectations, we strive to exceed them. Prescription Turf Care is a member of the Ohio Lawn Care Association and a member of the Knox County Chamber of Commerce. 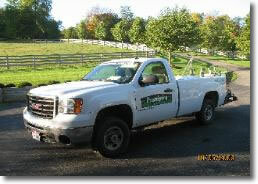 Our licensed staff has been educated in the field of agronomy and has extensive turf grass experience. We understand what to do… when to do it… and how to do it right. The lawn care program offered by Prescription Turf Care includes regular fertilization applications and comprehensive weed control to ensure a lush, healthy lawn. Our exclusive dry formulation consists of two types of slow release nitrogen to promote a deep green color and vigor required for a healthy lawn. Phosphorus is applied in sufficient quantities to ensure proper root growth and new rhizome (spreading) activity to promote thickening. Before we begin any grounds maintenance program, Prescription Turf Care conducts a complete lawn analysis. We measure thatch, test pH, and offer recommendations for specific lawn or weed problems. If grounds maintenance is requested, trees, shrubs and bed plantings are assessed to determine the most cost effective methods available to keep them in top condition. As a full-service, grounds maintenance provider, we can also add winter snow removal to create a comprehensive, 4-season maintenance plan uniquely designed to meet your needs. All of this information is then combined in a written estimate for you to review. This analysis is a free, no obligation service provided as part of our commitment to quality lawn care and grounds maintenance.